This is actually a recipe from Veggiestan, but we have had so many people in the shop asking about it that is seemed only fair to share it on line as well. If wheat has a history stretching back eight millennia, this recipe is in all likelihood nearly as old. I offer it as a curiosity – it is not, perhaps, something that you will all want to rush off and make. It is both strange and time-consuming. But it is possibly one of the first ever recipes. It is well nigh impossible to find this in books, but is rather passed on orally from mother to daughter, and so to get to the bottom of it I resorted to the best of methods, chatting to Persian and Afghan housewives. It is usually made at the time of Nowrooz – it is one of the seven items beginning with the letter ‘S’ which every house has to have to ensure a prosperous year. Its symbolism is clear: the wheat sprouts represent fertility and new life, the rebirth of the year, success for the months ahead. 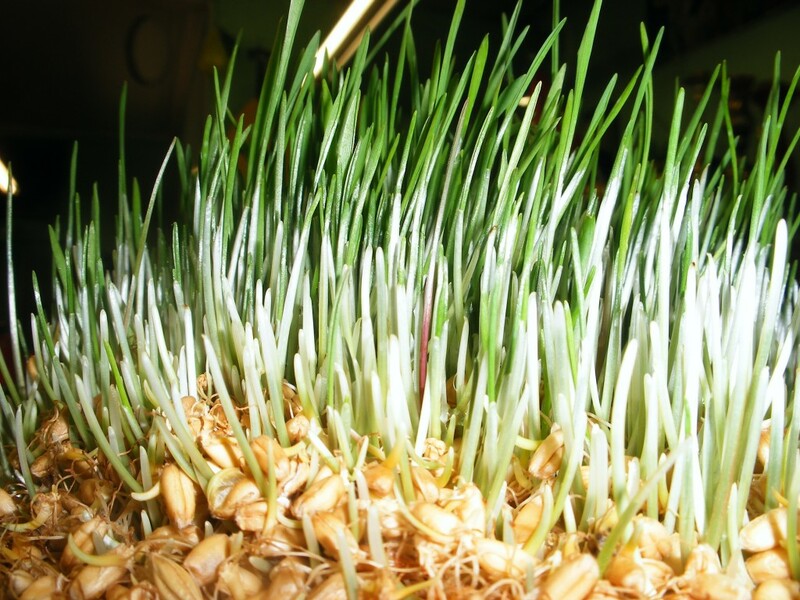 And as wheat grass is naturally sweet, the consumption of samenu is said to bring sweetness to the occasion. It is traditionally made overnight by the women of the household. Music and dancing accompany the creation thereof: who needs chick flicks and Chardonnay when you can sing and dance around a bubbling cauldron, huh? In Iran it is also made as a nazr, one of a range of foodstuffs prepared to share on certain anniversaries as a way of remembering the dead. Firstly you need to sprout the wheat. Pop it in a plastic tub, cover it with water and forget about it for three days. At the end of this time, drain it, wrap it in a wet cloth and place it back in the tub. You need to leave it somewhere warm and dark for another day or two, wetting the cloth a couple of times a day, until the wheat has germinated. On the fourth or fifth day, spread the wheat out on a tray and cover the surface with paper kitchen towels: you will need to spray these with water two to three times a day for a day or two. Watch the wheat like a greedy crow: as soon as it starts to show silvery green shoots, pounce and harvest it. That is to say, crumble it all in your hands and wash it thoroughly twice. Then put about half of it in the goblet of a blender (modern solution – few houses actually possess mill stones these days), add a couple of glasses of water, and blend. Settle a cloth (muslin is ideal, a clean tea towel will do) into a sieve over a jug and empty the contents of the blender into it, pressing with a spoon to force the liquid through (it is the liquid extract that you are after). Twist the ends of the cloth together and squeeze some more, and then put the wheat grinds in a tub to one side whilst you repeat the exercise with the other half of the wheat. Repeat the whole thing twice over again with the two batches of ground wheat, adding more water, and liquidising it all some more, and then squeezing the juice out into the jug: as long as the liquid is milky in appearance you are still extracting good stuff. Next put wheat juice and flour in a non-stick pan and blend it to a smooth paste using a wooden spoon. Put the pan on the hob and cook the mixture gently until the liquid all evaporates and it becomes quite biscuity – you will need to stir it constantly (or delegate sensibly) at this stage (now you know why they throw parties to make this stuff in Veggiestan). After a few minutes, add some more water – about two glasses – and beat the mixture so it is once again homogenised. And now you leave alone for a bit: turn the heat down as low as it will go, pop the lid on and let it do its thing for half an hour or so (a cursory stir after fifteen minutes would be a good idea). It should now be much thicker and darker. If you taste it you will see how curiously sweet it is: this comes naturally from the wheat. To complete the thickening process, spoon the paste into an oven tray and put it into the oven on a very low heat (which would be gas mark ¼: electric ovens go right down to 80?C) for about half an hour. Then turn the heat off and leave the samenu in the oven for another hour or so (or overnight). Scoop into a large bowl (or several smaller ones), garnish with the nuts if using, and chill until required. I do suggest that you eat it very very slowly, thus to appreciate all the work that went into it. This entry was posted in Recipes and tagged Nowrooz, samenou, samenu, wheat grass. Bookmark the permalink.